Description: An eastbound freight arrives at Butler Yard with an interesting set of power. Description: Train 254 rolls east approaching the NY 17C overpass with a pair of SOO units and 87 platforms. This train typically got a mix of NYSW and CP power, but SOO units were not common. Description: Train 554, the Sea Land connection that now comes off Conrail at Buffalo, seemed to get anything. Todays effort has a pair of SOO units, which were really unusual for this train. This day there are 85 stack platforms in tow. Description: Train 413 rolls slowly through the south end of Bevier St, at what used to be BX cabin, as the rear of its train is stretched out to BD. Once clear of those obstacles, it will start its run to Belden tunnel in earnest. Todays effort has six units-including one of SOO's five SD60M's-for its 128 cars, a heavy train in this era. Description: Train 413s six units are pulling hard to lift 128 cars to Belden tunnel. That non-dynamic brake ex B&M GP 40 won't be much help on the downhill side of the tunnel, as its lack of DB's will prevent the use of them on the trailing three units. 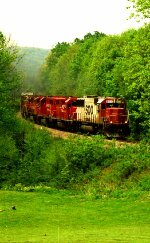 Description: There was a spate of GP 38s going north on 413 during this time. Not sure why the exodus, and they seemed to lead most of the time. One is on the point of todays 413 as it rolls through the north end crossovers to head for BD and a trip north. Check out that second unit, an ex SOO SD 40 in Golden Rodent paint. Description: In a turn reminiscent of Macys sending Christmas shoppers to Gimbels, a unit from CPs empire leads a train that will connect to the CN at Buffalo. SOO power was unheard of on 30T/31T, so this was quite unusual. Description: 165 blasts nortbound out of Binghamton for Montreal. Description: Crossing Harpursville trestle near Nineveh, NY. Note the slight difference in Dual Flags placement on the 2 SD40-2s. Description: Rolling past the structures at CPF 590. Description: This train the 165 is passing, could also be a 412. The D&H (or A&S - Albany & Susquehanna as some people like to call it) was once double tracked, but Guilford took most of it out. With the traffic volumes the D&H was experiencing in 2005, this led to many bottlenecks and would cause many trains to die, sometimes leaving multiple trains of the same symbol online at the same time. Description: The Soos former Milwaukee Shops still use the old turntable. The Soo engine on the left is one of my favorites, I was able to climb up and into it about three years ago. Description: I decided to post this mainly because it was one of those rare times where I was able to see a unit with its classlights lit up. Description: SOO 6027 ,sporting working class lights, runs towards Humboldt with another SOO SD60, 6057, trailing. 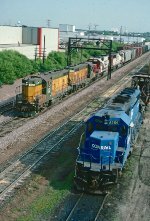 Description: SOO Line and CP diesels at Saint Paul. Description: One of my favorite Soos again! Soo 6027 with Soo 6041. 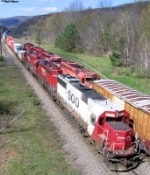 Plus, a Soo GP38-2 in the background. Description: 2 SD60's march the SOO/BN transfer out of Northtown on a suddenly cloudy day. Description: Soo 6044 is the trailing unit on the CP Humboldt Transfer. The train on the other track is the WC transfer waiting to get into Humboldt. Description: All three deer escaped with their lives....this time. Description: CP 9564 leads X500 across a creek near the Water treatment plant in Jenison. The crew on this train has but seven more miles to go before reaching CSX's Grand Rapids terminal: Wyoming yard. Description: CP X500 approaches the new overpass bridge at Thornapple River drive, just north of the G.R. Ford Intl. Airport. The end of the train is visible in the top left corner of this photo.